"NASA astronaut Rex Walheim participated in an evaluation of the Advanced Crew Escape Suit (ACES) in the Active Response Gravity Offload System, or ARGOS, at the Johnson Space Center on Tuesday, June, 5, 2012. The modified ACES suit is fully integrated with Orion life support systems and will be used by crews for ascent and entry, as well as light extra vehicular activities, commonly referred to as spacewalks. The ARGOS system allows an astronaut to be suspended and have full freedom of motion, simulating a microgravity environment. 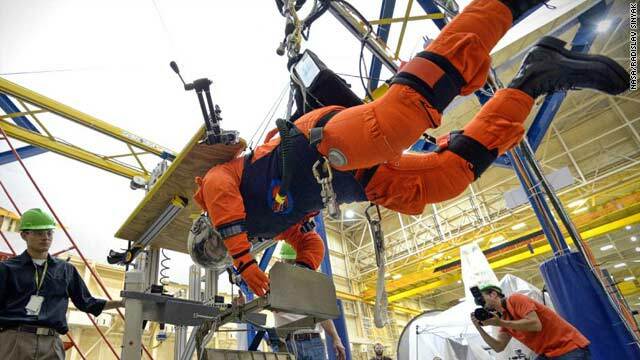 During this test, Walheim evaluated the amount of dexterity the suit would provide for various tasks including translating across handrails, working with tools and entering a spacecraft hatch."